Buy Bute Island Creamy Sheese with Spring Onion & Cracked Black Pepper in the UK from our online shop or directly from our independent Scottish store. 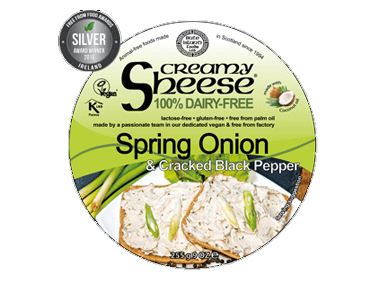 Spring Onion & Cracked Black Pepper: posh dairy-free alternative to cream cheese. Improve any pasta dish or roasted vegetables tart by adding Spring Onion Creamy Sheese to your preparation, or melt some on top of a hot mushrooms and potatoes mix. The Spring Onion Creamy Sheese is a wonderful new addition to your non-animal larder, as you can use it to make any soup or sauce thicker and deliciously creamy. It is also a wonderful option to serve cold for an aperitif, alongside crackers, sliced fresh bread or crudités. Always a popular flavour with vegans and non-vegans alike when doing tastings for our annual Scotland Weeks! Water, Coconut Oil, Soya Protein Concentrate, Salt, Spirit Vinegar, Lactic Acid (Dairy-Free), Sugar, Spring Onion, Black Pepper, Thickener (Carrageenan), Natural Flavourings. Spring Onion & Cracked Black Pepper Creamy Pasta with Watercress, Spinach and Pine Nuts. Delicious vegan pasta! This recipe contains 255g tub of Spring Onion & Cracked Black Pepper Creamy Shee. Stamppot is a very traditional Dutch way of cooking meals. Basically, you can mash any vegetable with potatoes and serve it with gravy and sausages. Try cooked onions, carrot and potato mash (Hutspot), raw endive or lettuce and potato mash (andijviestamp) or curly kale with mashed potato (boerenkoolstamp). This recipe contains 200g Bute Island Black pepper/chives cream sheese. We sell real Bute Island and other Dairy Free Cheese directly from our shop in Scotland and online throughout the UK. View more products from Bute Island. Where can you buy real Bute Creamy Spring Onion safely online? If you are wondering where you can buy Bute Island Creamy Sheese with Spring Onion & Cracked Black Pepper safely online in the UK, then shop with us. We are an actual health foods shop; with real people selling real foods and products. Our award-winning independent shop is located in Stirling, Scotland since 1976. You can buy our Dairy Free Cheese in store or safely place an order with us online or over the phone. Bute Creamy Spring Onion - Bute Island Creamy Sheese with Spring Onion & Cracked Black Pepper in Dairy Free Cheese and Chilled Foods.